Chris Nieto's work can be found at the Wheelwright Museum in Santa Fe, he exhibits at the widely renowned art shows at the Heard Museum in Phoenix and is a well-respected citizen of Santo Domingo Pueblo where he is very active in religious and ceremonial affairs. He is a kind and generous man who has become a close friend through our years of working together. His wife, Luwanna, often aids him by stringing his necklaces. This gorgeous arrowhead pendant is inlaid with hand-cut tiles of Kingman turquoise, Royston turquoise, apple coral, jet, mother of pearl and white clam shell. This beautifully precise, multi-colored mosaic work is bordered by an edge of black jet marked by stripes of Kingman turquoise, jet, apple coral and mother of pearl. The pendant forms one portion of this beautiful inlay work, while the wide, round bale displays additional perfect precision in its tightly fitted jet tiles which wrap all the way around the face of the bale while separate tiles of jet cap the round openings of the bale. The large, arrowhead-shaped pendant spares no richness in its exquisite inlay work, nor does the six-strand necklace. 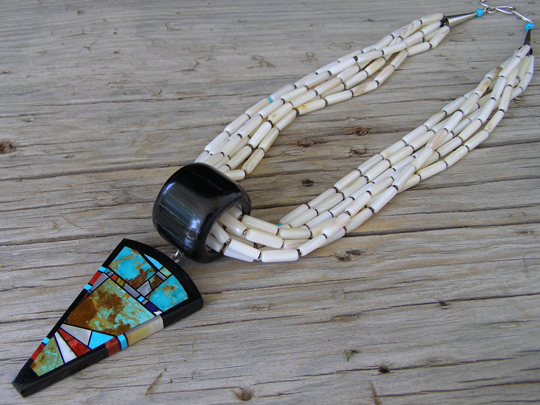 The beads of the necklace are made from abalone shell. Some of the beads retain a suggestion of the iridescence of the abalone, but most of beads are made from a deeper part of the shell which is somewhat opaque and closer to ivory in color. We've never seen anyone make beads like this, but Chris can make beads from any shell and these are an exquisite rarity. The photographs shown here accurately represent this necklace, but they cannot show or tell its full beauty, nor relate the comfort of wearing it. The strands are just 20" in length; it's essentially a choker necklace that rides high so that the pendant hugs the sternum and never swings, but rather holds fast to you. You needn't be tall to wear this, but at 20 inches in length, it still works for a taller person. CTN (for Christopher Thomas Nieto) and SDP (for Santo Domingo Pueblo Pueblo) are incised in the jet foundation on the back side of the pendant. Top edge of bale to bottom edge of pendant: 4 1/2"